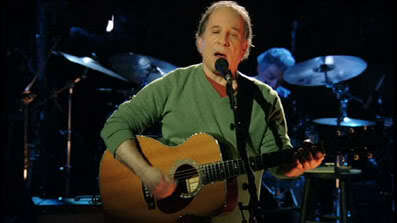 The ninth post in our very popular Covered In Folk series addresses the solo output of Paul Simon. This is unusual — with the exception of our ongoing Beatles series (part 1, part 2), previous posts have covered the total output of a given artist; see, for example, posts on the songs of Lou Reed and The Velvet Underground and Tim and Neil Finn. It’s also backwards, since Simon’s solo career is really his second wave of fame, after his first incarnation as a folk icon with partner Art Garfunkel. But however tempting it was to address both phases of Paul Simon’s career in one post, it was just too much to tackle all at once. And, as you’ll see below, there’s something especially timely about Paul Simon covers, as regards a specific subsection of the folkworld. So stay tuned in the coming weeks for the songs of Simon and Garfunkel, including folkcovers by the Indigo Girls, Jonatha Brooke, Johnny Cash, and Emiliana Torrini. And for those of you that don’t otherwise follow the hippest darlings of the blogworld, enjoy today’s introduction to a branch of folk music so new, its artists don’t even use the term. The solo songs of Paul Simon have enjoyed a sort of renaissance in the ears of the indie world recently, due in no small part to three bootlegs floating around the blogs: Swedish indie-pop artist Jens Lekman’s radio-station cover of You Can Call Me Al, and two versions of Graceland, one from indie remix experimentalists Hot Chip, the other from Dan Rossen of psychfolk indiedarlings Grizzly Bear. I’ve mentioned my bias towards good sound quality here before; though I know that the swamp of sound is deliberate in the case of the Rossen cover (in the other covers, it’s a result of off-the-radio taping), the genuinely hissy, fuzzy quality of all three of these recordings keeps me from passing these songs on without caveat. That said, these songs are worth serious consideration, so they’re here today, if you want ‘em. Fans of the abovementioned artists either already have these, or need them badly; if you’ve never heard these artists of the new indie almost-folk movement, these covers provide a decent entry into their core sound, but I highly recommend tracking down more of their work before you decide whether you’re a fan or not. But though I’m fond of these interpretations, and respect them for the love they clearly show towards the originals, I also think there’s better Simoncovers out there, both in and out of the indiefolkworld. There’s plenty to pick from; Simon’s songs address universal themes, and they are eminently singable. There are as many acoustic Paul Simon covers as there are streetcorner buskers. But most merely sandpaper these songs, stripping the instrumentation away to deliver them with broken voice and road guitar. Only a few bring new life to songs which have forever been marked as an emotional mirror for a generation of baby boomers. Now that takes talent, forethought, and perspiration. Today, we bring our usual full plate brimming with covers of the post-Simon and Garfunkel work of Paul Simon. Not all manage to surpass the originals, it’s true. Like the newest batch, some are imperfect, albeit spectacularly so. But there’s something special and wonderful and new in each one. And the best ones, like the best covers of anything once-and-forever-loved, remind you of how wonderful the originals were without sacrificing the power of their interpretation. As always, today’s songs are a pretty diverse set, though they tend to cluster around the solo acoustic approach. Some are earnestly, almost delicately reinterpreted, others are lo-fi, almost all are live. Very few come from artists that consider themselves folk, but each has just enough folk sensibility to be welcomed into the fold. I’ll leave it to each of you to find your own favorites. Just remember: there’s more to a great cover than who’s doing the covering. As above; flawed but powerful recordings of covers with real possibility. The recorded output of Jens Lenkman, Grizzly Bear, and Hot Chip aren’t always folk music, but they always make my ears happy; see today’s bonus section for further evidence that these folks are worth a second listen. Two of the post-folk indie movement’s newest, coolest musical phenomena boil down what was once a jumpin’ streetfolk tune into a folk lullaby (Julie Doiron) and an oldtimey backalley strut (Peter Bjorn and John). Plucky all-out solo singer-songwriter fare from Peter Mulvey’s all-covers subway session Ten Thousand Mornings, previously featured here. Two of Paul Simon’s most wistful, etherial tunes set to perfection by the mistress of dark resophonic strings and clear-voiced longing. Eva, your songs live on without you. Follow the links above to artist homepages. Buy compilations, songs, and albums direct from the source. Support labels, stores, and artists. It’s just that simple. We’ll have a full set of stellar folk covers of Simon and Garfunkel songs soon enough. In the meanwhile, stay tuned for a post on the coverwork of folk punk artist Billy Bragg, yet another Single Song Sunday, and the third installment in our very popular (Re)Covered series, all in the next week or so.